Signed on back, top: Erliss Pung. An excellent, though dark, highly expressive picture, that was purchased for the museum in 1982 when it won the award in the spring senior show (according to the little ticket on the back, it cost a hundred dollar). What does “She” mean? As usual “abstract” expressionist works are figurative, which figure is submitted to extreme freedom of treatment by the artist, in order to express sentiment, emotion, empathy or understanding. De Kooning’s Women are exemplary of this attitude, and we think of them in front of Pung’s work. She must be such a woman, possibly with a dark skin in a wide red dress. 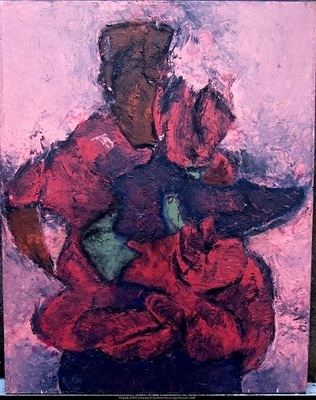 The paint is posed with vigor, almost with rudeness and conveys a subconscious emotion. Is She alone and does She move, whirling? Or does She sit and carries a child in her lap? Is She a Night Club Dancer or a Madonna, to use the extremes? The eye hesitates, and suddenly the mind too. Would this ambiguity be one of the interesting, the essential features of the work? Would we ask the artist? No! She has spoken: with female ambiguity about female ambiguity. And we have to find out for ourselves, with our own ambiguities.